Twitter personality “Abu Suleymaan” is a propagandist for ISIS.Abu Suleymaan, Twitter post, July 27, 2015, 8:32 a.m., https://twitter.com/TwistedStrangz/status/625690209276047360. His accounts have been repeatedly suspended by Twitter. Abu Suleymaan tweets news on ISIS’s actions, as well as the response of the Western-led coalition.Abu Suleymaan, Twitter post, July 27, 2015, 2:15 a.m., https://twitter.com/TwistedStrangz/status/625595335017144320. 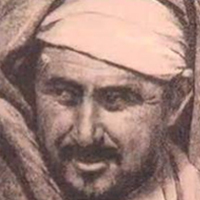 Abu Suleymaan is technologically informed and shares his knowledge with his followers. 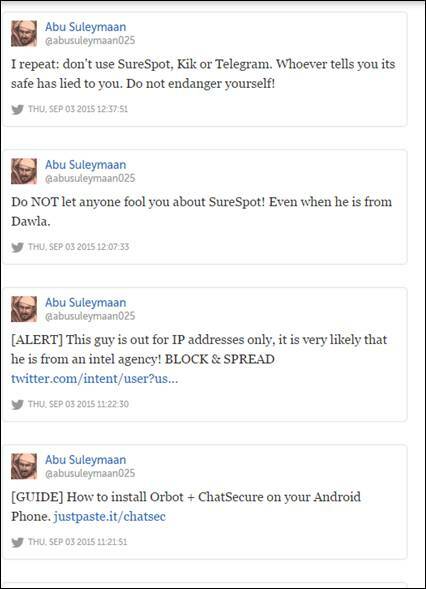 He regularly warns followers about which messaging and social media platforms he believes are unsafe to use and has urged followers to immediately stop using various platforms.Abu Suleyman, Twitter, accessed September 3, 2015, http://www.twitter.com/abusuleymaan025. Abu Suleymaan, Twitter post, September 26, 2015, 8:54 p.m., https://twitter.com/WilayatNinawa/status/647937234960842752. Also on this day, he disseminated details of a Mohammed cartoon contest hosted by Stop Islamization of Europe held in Copenhagen, appealing to “Brothers from Denmark.”Abu Suleymaan, Twitter post, September 26, 2015, 9:02 a.m., https://twitter.com/WilayatNinawa/status/647758185764405248. @abusuleymaan14Abu Suleymaan, Twitter post, July 25, 2015, 3:46 p.m., https://twitter.com/abusuleymaan14/status/625074625752526848. @abusuleymaan16Abu Suleymaan, Twitter, accessed August 9, 2015, http://twitter.com/abusuleymaan16. @abusuleymaan17Abu Suleymaan, Twitter, accessed August 19, 2015, http://twitter.com/abusuleymaan17. @abusuleymaan18Abu Suleymaan, Twitter, accessed August 23, 2015, http://twitter.com/abusuleymaan18. @abusuleymaan24Abu Suleymaan, Twitter, accessed September 2, 2015, http://twitter.com/abusuleymaan24. 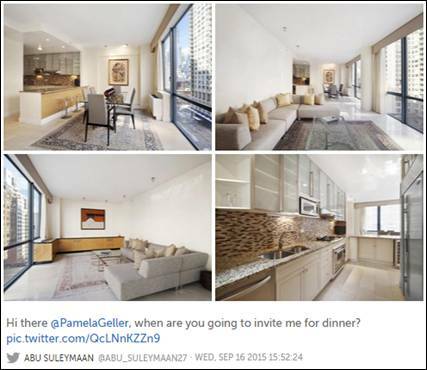 @abusuleymaan025Abu Suleymaan, Twitter, accessed September 13, 2015, http://twitter.com/abusuleymaan025. @sisi_no_boatAbu Suleymaan, Twitter post, July 16, 2015, 4:26 p.m., https://twitter.com/sisi_backup/status/621823243821969408. @sisibackupAbu Suleymaan, Twitter, accessed August 3, 2015, https://twitter.com/sisi_backup. @TwistedStrangzAbu Suleymaan, Twitter, accessed August 3, 2015, https://twitter.com/TwistedStrangz. @WilayatSinaiAbu Suleymaan, Twitter, accessed August 7, 2015, https://twitter.com/WilayatSinai. @WilayatNinawaAbu Suleymaan, Twitter, accessed October 5, 2015, https://twitter.com/search?q=%40WilayatNinawa. “By the way, Jews have a very bad smell. Even if they shower 2 times a day.” (Tweet)Abu Suleymaan, Twitter post, September 26, 2015, 8:54 p.m., https://twitter.com/WilayatNinawa/status/647937234960842752. “This proves their army is just a bunch of amateurs shitting their pants for soldiers of the Islamic State. 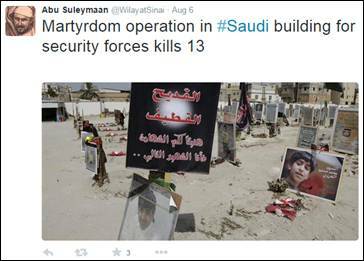 Wilayat Sinai.” (Tweet)Abu Suleymaan, Twitter, accessed September 14, 2015, http://twitter.com/abusuleymaan025. “Please brothers and sisters if you see an activist tweeting an IS offensive don’t retweet!! I advise you all to remove the tweets about Iraq.” (Tweet)Abu Suleymaan, Twitter, accessed September 8, 2015, http://twitter.com/abusuleymaan025. “People should know when propaganda war must be waged. Ask yourself before you tweet something, is this benefitting IS or the enemy?” (Tweet)Abu Suleymaan, Twitter post, July 27, 2015, 8:32 a.m., https://twitter.com/TwistedStrangz/status/625690209276047360. “Breaking: Assim Al Hakeem gave bay’ah to Islamic State after repenting.” (Tweet)Abu Suleymaan, Twitter post, July 26, 2015, 1:03 a.m., https://twitter.com/abusuleymaan14/status/625214892660912128. “IS digging new trenches near the city of #Jarabulus located on the Turkish-Syrian border.” (Tweet)Abu Suleymaan, Twitter post, July 26, 2015, 8:24 a.m., https://twitter.com/TwistedStrangz/status/625325751387205633. “I was watching a new Islamic State release, until i realized my window was open.” (Tweet)Abu Suleymaan, Twitter post, July 26, 2015, 6:01 a.m., https://twitter.com/TwistedStrangz/status/625289856390926336. “Anjem Choudary is the best da’ee of the west.” (Tweet)Abu Suleymaan, Twitter post, July 17, 2015, 9:41 p.m., https://twitter.com/WilayatSinai/status/622264794641526784. “Al Shabaab released a video today really worth watching! !” (Tweet)Abu Suleymaan, Twitter post, July 16, 2015, 6:29 p.m., https://twitter.com/WilayatSinai/status/621854162138083328. “Imagine one day chilling in Paradise with our Prophets, Sahaba, Osama Bin Laden, Zarqawi, Abu Bakr & Omar Al Baghdadi and their likes.” (Tweet)Abu Suleymaan, Twitter post, July 16, 2015, 6:50 p.m., https://twitter.com/WilayatSinai/status/621859577093619713.